by a real open wood fire brought to you by Lucy’s Logs. 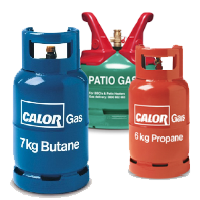 Contact us today on 01706 495036 to place your order. a warmer and more comforting fire that lasts that little bit longer. Contact us today on 01706 495036 to place your order. 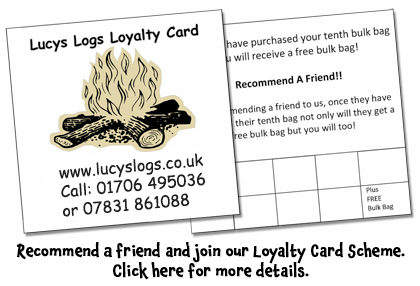 fires are kept going for longer with Lucy’s seasoned logs, kiln dried logs and kindling. Contact us today on 01706 495036 to place your order. and toasty is how you want to feel come the colder autumn and winter months. Contact us today on 01706 495036 to place your order. Firewood, seasoned logs and kiln dried logs specialists supplying the whole of the UK. To place an order please call the office on 01706 495036. 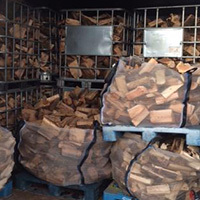 Lucy’s Logs are specialists in the supply of firewood, seasoned logs, kiln dried logs and kindling to homes and businesses throughout the UK including hotels, pubs, restaurants and care homes. We are registered on the Biomass Suppliers List. Join the Lucy’s Logs Loyalty Card Scheme for fantastic benefits and offers! Once you have purchased your tenth bulk bag you will receive a free bulk bag! Recommend a friend to us, and once they have purchased their tenth bulk bag not only will they get a free bulk bag but you will too! Our seasoned firewood logs are ideal for wood burners, open fires, multi-fuel burners, chimineas and central heating burners, and because our logs are seasoned with low moisture content they burn more slowly which creates a hotter burn that lasts that little bit longer. We offer a full delivery service along with a local ‘cart and stack’ service if required or you can collect direct from us. We can supply logs in netted bags, bulk bags and loose tipped. Logs can be standard cut to approximately 8″ or we can cut all your logs to your required length at no extra charge. Contact us on 01706 495036 and 07831 861088 or email info@lucyslogs.co.uk for further information or to place an order and arrange for delivery. We look forward to hearing from you. BUY TEN BULK BAGS, GET ONE FREE! Buy 10 bulk bags and you will receive an extra bulk bag free. Also, if you recommend a friend and your friend buys 10 bulk bags you will receive another extra bulk bag completely free.